While in prison, before his execution at Lahore, Guru Arjun had sent a message to his son, Guru Hargobind, then aged only eleven, that he should henceforth maintain an army. At the very time of his installation as Guru, he insisted that he should wear two swords, one representing his spiritual leadership and the other his temporal and political leadership. Soon after it, he constructed in front of the Amritsar temple, another building called the Akal Takht (God's throne) as the seat of temporal power. This place continues to the present day as the centre of every sociopolitical deliberation and power of the community. There, like the two swords he wore, he raised aloft two flags representing the two aspects of his activities. He told his followers, "My rosary shall be my swordbelt and on my turban I shall wear the emblem of royalty." The Sikhs were already engaged in the trade of horses and the Guru advised every Sikh to keep a sword and maintain a horse, wherever possible. He started recruiting a regular army. He had a personal bodyguard of 57 horsemen and kept 700 horses, 60 gunmen and 500 infantry men. Thus a state within a state, started and developed by the earlier Gurus, was consolidated by him. When this news reached the Emperor, he demanded from the Guru the fine imposed on his father. The Guru was imprisoned in the Gwalior fort along with other political prisoners of high status. Later he was released. There is an important incident which brings out the religious policy of the Gurus. One Ram Das, a Maharashtra saint, met Guru Hargobind. He questioned him as to how he reconciled his being a successor to the spiritual seat of Guru Nanak with his living as a soldier, maintaining an army and calling himself a true Emperor. The Guru replied that Guru Nanak had given up mammon (greed for money). He had not renounced the world, and that the sword was for the double purpose of protecting the poor and destroying the tyrant. These words of the Guru most clearly bring out the religious and spiritual philosophy of Sikh mysticism, its originality and its break with the past. Persons brought up in the tradition of old beliefs and ideas of dichotomy between the religious and the temporal life find it difficult to understand and grasp the significance of the Guru's system. The problem of comprehension that confronted saint Ram Das was the same as arose with the Nath Yogis in their dialogue with Guru Nanak. It arises even now with some of our present-day academicians. But, for the Sikh mystic, participation in life is spiritually essential. Consequently, the defence of moral life, reaction and responses to challenges from the environment form an integral part of the Gurus' mystic system. The reply of Guru Hargobind is an unambiguous clarification of the system of Guru Nanak as understood by the Gurus themselves. This also explains the various empirical steps taken by the first five Gurus in order to develop their religious system and organise the Sikhs in the way they did. Saint Ram Das's meeting with the Guru had a great historical consequence, for he was so impressed by the Guru's thesis that he later trained Shivaji, the great Maratha leader, in the same manner. Guru Hargobind sponsored the cause of the downtrodden Hindus and provided leadership to the oppressed people of Punjab. In this struggle, he fought six battles with the Mughals in the plains of the Punjab. People came to him and joined his forces because they felt that no one else had the power to stand against the Emperor. In one of these battles he defeated 7,000 Mughal soldiers. Finally, he settled at Kiratpur. His reputation as a military leader spread and ambassadors of the hill Rajas waited upon him. The organisation of the Sikhs into a separate socio-religious group with political implications had started from the time of the very first Guru. This close and integral combination of the temporal and the spiritual life was a thesis which was foreign to the Indian tradition. No wonder that some of the people around the Sixth Guru, including his own followers, could not understand the spiritual character of these military developments. This explains two points. First, that the transformation of the community into a spirituo- political organisation could only be gradual, because the Gurus had to carry the people with them. Unfortunately, they had all been conditioned by the old traditions. The full understanding and acceptance of the new thesis could only be slow. The Gurus, naturally, had to wait till their followers fully realised the implications of the new doctrine and owned its responsibilities. Secondly, it also confirms the view that the object was to organise a mission and a movement in the empirical world and not merely to deliver a message and embody it in a scripture or a mythical tale. The scriptural thesis had to be lived among the people and not in the seclusion of a monastery for the training of a few. The aim was to uplift everyone irrespective of caste and creed and to show that each one, howsoever placed, could tread the spiritual path. This choice was open to everyone and the Guru was there to organise and lead the movement. Hence, the progress could only be gradual both in the education of the people and in the pace of the movement. The latter could not outstrip the former. The task was stupendous. For, it had to take place in the face of the understandable opposition of one of the greatest empires of all times. One incident is very significant of the socio-political climate in the Guru's camp. During a hunt being carried out by the Imperial party in a jungle, the Sikhs also entered the same area in pursuit of game. The Sikhs got hold of a falcon, which was claimed by the official party. A clash took place and the Imperial forces were beaten off. But, what is important is the approval of the Sikhs who stressed, "you are talking of the return of the baz (falcon), we are after your tag (crown)." It clearly shows the independence of political status claimed by the Guru and his Sikhs. Guru Hargobind was sixth in the spiritual descent form Guru Nanak, was born the only son of Guru Arjan and Mata Ganga on Har Vadi 7, 1652 BK / 19 June 1595 at Vadali, now called Vadali Guru, a village near Amritsar. As a child, he escaped being poisoned by a jealoous uncle and being bitten by a cobra thrown in his way. He also survived a virulent attack of smallpox and grew up into a tall and handsome youth. His contribution to Sikhism and Sikhs can be summed up in one phrase i.e. "making them Saints and Soldiers". 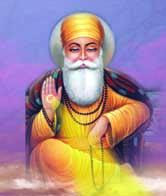 He received his early education and training at the hands of two revered Sikhs of that time Bhai Gurdas and Baba Buddha. The former taught him the religious texts and the latter the manly arts of swordsmanship and archery. He was barely 11 years of age when his father, Guru Arjan, was martyred in Lahore. Guru Arjan had on Jeth vadz 25 1663 Bikrami May 1606 nominated him his successor and, according to the Sri Gur Pratap Suraj Granth, sent him instruction "to ascend the throne fully armed, and have armed men, as many as you can, to accompany you." For the ceremonies of succession which took place on 26 Har 1663 Bk/24 May 1606, Guru Hargobind chose himself a warrior's equipment. He sat on a seat he had had erected in front of the holy Harimandar, with two swords on his person, declaring one to he the symbol of the spiritual and the other that of his temporal investiture. Hukamnamas were issued to sangats on Har vadz 2,1663 Bk/ 12 June 1606 to come with offerings of arms and horses. Guru Hargobind maintained a retinue of fifty-two armed Sikhs. Many more came to offer him their services, and several of them were provided with horses and weapons. Manly sports became popular and bards such as 'Abdulla and Nattha were engaged to recite heroic poetry. Guru Hargobind combined with soldierly demeanour a compassionate disposition and carried out his spiritual office in keeping with the custom of his predecessors. "He," as says the Mahima Prakash, "arose three hours before daybreak and sat in seclusion, to concentrate on the Divine. Then he dressed himself and repaired to the presence of the Holy Book and began to recite it silently. None entered to interrupt him. None could fathom the depth of his spiritual absorption. " Reports about the splendid style of Guru Hargobind led Emperor Jahngir to pass orders for his detention in the Fort of Gwalior. According to the Dabistan-i-Mazahib, the charge levelled against him was that he had not paid the fine imposed on his father. For how long he remained in the Fort cannot be stated with certainty. From forty days to twelve years, in Dabistan-i-Mazahib, several different periods of time are mentioned. It seems that Guru Hargobind remained in the Fort for a few months during 1617-19 whereafter he was required to stay in the royal camp under surveillance for some time. During his detention in Gwalior, Sikhs made trips to the city in batches to see him and, when disallowed to enter the Fort, they proffered obeisance from outside its walls and returned. As time came for Guru Hargobind to be released from the Fort, he came out on the condition that all other detenues were freed, too. He led fifty-two prisoners out of the Fort. Bandichhor? (Liberator Benign) is the title by which he is remembered to this day. When at last Guru Hargobind reached Amritsar Sikhs illuminated the town. The anniversary of the event is still celebrated at Harimandar, the Golden Temple, with Lights and fireworks. Emperor Jahangir from now on continued to be conciliatory and, according to Sikh tradition, he delivered to Guru Hargobind Chandu Shah, who took part of the responsibility far the execution of Guru Arjan and for his own incarceration. 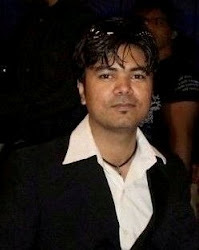 Chandu Shah met with a violent end at the hands of the Sikhs. On his lands, also made over to him, Guru Hargobind founded a new town Which came to be known as Sri Hargobindpur. As the work commenced, Bhagvan Das, a local landlord, objected and attacked the Sikhs with a party of his men. Bhagvan Das was killed in the skirmish. His son, Ratan Chand, and Chandu Shah's son, Karam Chand, sought help from the Mughal faujdar of Jalandhar who sent a body of troops against Guru Hargobind. They were repulsed in the battle that ensued. Both these actions were fought in the vicinity of Ruhela, the first on 28 Assu 1678 Bk/28 September 1621 and the second on 3 Kattak 1678 Bk/4 October 1621. At Sri Hargobindpur, the Guru built along with the dharamsala a mosque for the Muslims. In 1628 the city of Amritsar witnessed the first onslaught on it by the Mughals. Shah Jahan, who succeded his father in 1627 knew that Sikhism had undergone a metamorphosis under Guru Hargobind, the only son of the martyred fifth Guru. This according to the Bhatt Vahi Multan Sindis, was fought on Baisakh 17,1691 Bk/14 April 1634. He had donned two swords of Miri (temporal) and Piri (spiritual), had raised an Akal Takht (1609), built Lohgarh (fortress), collected arms,3 recruited Pathan mercenaries under Paindeh Khan and was giving military training to his followers. On a pretext of getting a royal hawk released from the Guru an expedition of 7,000 strong under Ghulam Rasul Khan Panj Hazari and Mukhlis Khan, Deputy Nazim, was sent. Guru Hargobind would not have liked to make the holy place a battle-ground and had enjoined that "the Harimandir is specially devoted to God's service. It should never be defiled with any impurity of the human body ". He was busy making preparations for the wedding of his daughter Bibi Viro. The combat with royal forces took place at Gumtala, then a suburb of Amritsar. Guru Bilas Patshahi Chhevin 4 gives a vivid account of the encounter, the feats of valour displayed by Bidhia, Jetha, and Piraga each at the head of 100 villagers from Kambowal, who at the moment had arrived to pay homage to the Sixth Guru. The royal troops suffered heavy casualities, including those of Mukhlis Khan the commander of the Mughal army, Maula Bux, son of Qutb-ud-Din, a Qazi of Lahore and Zaffar Beg, a commander. Ghulam Rasul Khan fled. Those thirteen killed on the Guru's side were Bhais Nand, Jait, Piraga, Tota, Tiloka, Sain Das, Paira, Bhagtu, Ananta, Nihala, Takhtu, Mohan and Gopal.5 They died in the defence of the city, the temple and the Guru. Soon oon afterwards Guru Hargobind left Amritsar, this time taking with him the holy Granth Sahib seated in the Harimandar. The first long halt was at Darauh, near Moga, in present-day Faridkot district. From there Gura Hargobind sent the Granth Sahib with the family to Kartarpur. He himself sojourned in the Malva, visiting his Sikhs and confronting, on 16 December 1634, the Mughal troops in yet another battle, this time at Lahira, near Mehraj, now in Bathinda district. Another armed clash took place at Kartarpur on 29-30 Baisakh 1692 Bk/26-27 April 1635, when Guru Hargobind's own erstwhile Pathan follower, Painda Khan, led out a Mughal force against him. According to Teja Singh and Ganda Singh Guru Hargobind had won four battles, but as his purpose had always been only defensive. Guru Hargobind finally retired to Kiratpur where he spent the remaining nine years of his life in peace. The town was of the Guru's own creation and had existed since Baba Sri Chand had, according to the evidence of the Bhatt Vahis, broken ground at his request, on Baisakh suds Puranmashl 1683 Bk/l May 1626. The site had been gifted by Raja Kalyan Chand of Kahlur, one of the chieftains who had won their reprieve at Gwalior through Guru Hargobind's intercession. Kiratpur now became the centre of the Sikh faith. Sikhs came here from all parts to see the Guru. Guru Hargobind gave most of his time to religious devotions. Contact was maintained with sangats in farflung places, and old warriors like Bidhi Chand were sent out as preachers. For Sikhs the roles of saint and soldier had become mutually complementary. 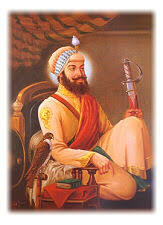 About the Guru himself, Bhai Gurdas wrote: "Great hero is Guru Hargobind. He is the vanquisher of armies, but his heart is full of love and charity." This synthesis of the heroic and the spiritual was Guru Hargobind's distinctive contribution to the evolution of Sikh society. Guru Hargobind had travelled extensively in the Punjab spreading the word of Guru Nanak. He had also visited places such as Nanakmata and Srinagar in Garhval (where the famous Maratha saint Samarth Ramdas met him) in the cast and Kashmir in the north. The journey to Kashmir was made in 1620 in the company of Emperor Jahangir, and Srinagar, Baramula, Uri and Poonchh were among the places visited. Gurdwaras in these and in many places in the Punjab and outside honour the memory of Guru Hargobind. Guru Hargobind, like all of his predecessors, lived a married life. He had six children — five sons and a daughter. Gurditta, Ant Rai and the daughter Bibi Viro, Suraj Mall, Atal Rai and Teg Bahadur. Two of his sons, Baba Gurditta and Atal Rai, died in his lifetime . Guru Hargobind passed away on Chet 5,1701 Bk/3 March 1644 at Kiratpur.